This intense ochre yellow flour has a distinctive pungent and acerbic fragrance. It has a sweet, highly aromatic flavour. 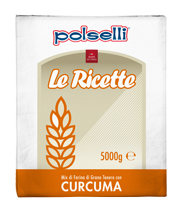 The powdered turmeric means this flour has detoxifying and anti-inflammatory properties. Type ‘0’ soft wheat flour, powdered turmeric. Aubergines, gorgonzola, mortadella and chicken steaks.